Do you need to add things like checkboxes to your products so that you can sell upgrades, sizes, extras, gift options, color choices, etc? That�s what this plugin does. And if that wasn�t not enough, you can edit the options of multiple products at the same time. You can even add options to the checkout page. 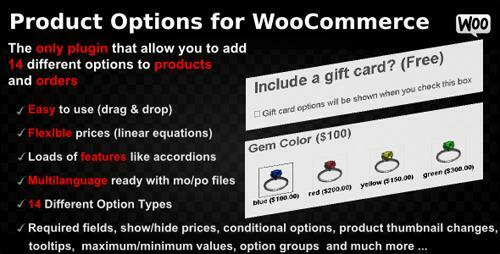 Product Options for WooCommerce plugin is also compatible with�Visual Composer WooCommerce Add-On. Using Visual Composer WooCommerce Add-On, you can add options to your products using Visual Composer. Product options are much easier, more flexible and faster to use than variable products. The product options can have prices and lots of other features including option groups which all you to add groups of options to all products, product categories or products a containing key word.